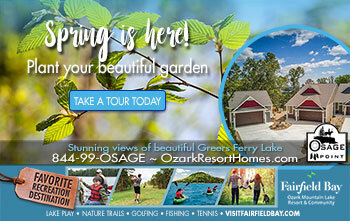 The autumn months are truly the best time to come enjoy the natural beauty of the Ozarks in Fairfield Bay. Nearly 1.2 million acres of the Ozarks burst with hues of orange, reds, and yellows. Explore some of the 340 miles of shoreline of Greers Ferry Lake. Follow the eagles as they soar above the 1.2 million acre Ozark National Forest. Experience the annual Ozark Mountain leaves change during a scenic driving tour, or hike and bike more than 30 miles of the newly developed trail system. Or play a round of golf on one of Fairfield Bay’s two premier courses. Today, begin your stay with a bit of history, and while you’re learning about Fairfield Bay’s past, rub elbows with a few locals and discover their favorite hidden gems. Autumn view of majestic Sugar Loaf Mountain, home to one-of-the first designated national scenic trails in America. 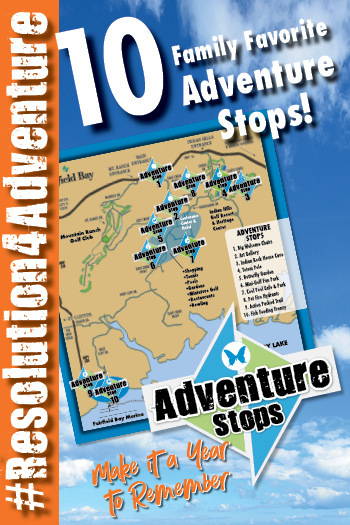 Take the shuttle out to the island and enjoy the 1 mile hike to see the best view in the region. Marina: 501-884-6030. The autumn months are truly the best time to come enjoy the natural beauty of the Ozarks in Fairfeld Bay. Nearly 1.2 million acres of the Ozarks burst with hues of orange, reds, and yellows. The autumn months are truly the best time to come enjoy the natural beauty of the Ozarks in Fair eld Bay. Nearly 1.2 million acres of the Ozarks burst with hues of orange, reds, and yellows. 1. Conference, Arts and Visitor Center 3 p.m. 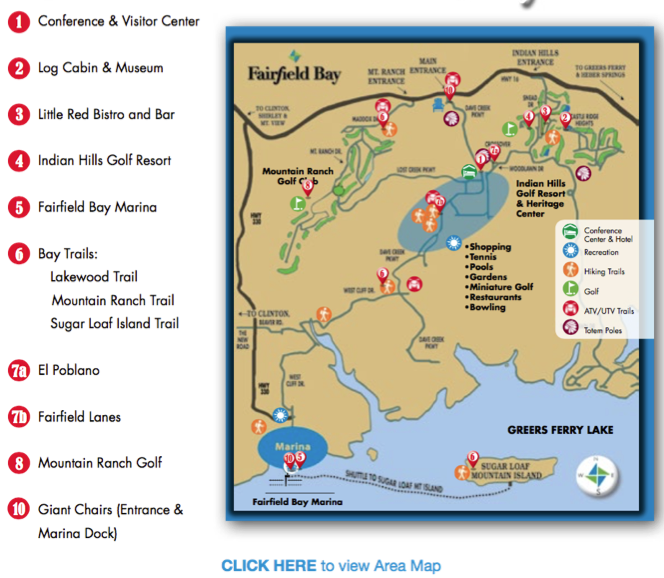 Consider Fairfield Bay Conference & Visitor Center your landing pad! The bustling center is a conference, performing and visual arts center all in one, as well as your home base for information. Relax in the lounge or outside on the deck. Pick up some area information and maps, and get acquainted. And if it’s chilly, grab a drink and warm up by the welcoming hearth. It’s here where you’ll be stepping into the North Central Arkansas fine arts gallery, featuring works of stained glass, paintings and sculpture; many of these one-of-a-kind pieces are available for purchase…what a perfect souvenir! Ask if “Our Towne Productions” has a theater show during your visit. You’ll be planning your next visit before you even start this one; if you aren’t in town for one of the many festivals or celebrations we bet you’ll want to return. Check out our calendar of events. As tough as it may be, tear yourself away from the beautiful Center and head toward your next adventure in Fairfield Bay. 8 Travel Guides to Explore. Indian Rock House – nestled under a hillside at Indian Hills Golf Resort, this natural sandstone grotto is more than 1000 years old. De Soto visited the American Indians here in 1542 as he searched for the Fountain of Youth. 2. Discover the History 4 p.m.
There’s pockets of incredible history in this outdoor paradise. One of the most impressive and memorable places is Indian Rock House Cave. On the National Historic Registry as Edgemont Shelter, this beautiful natural structure sheltered primitive people as far back as 1000 BC. To see this incredible historical site, lets begin at the History Complex. From there, take the Indian Rock Trail. The trail gives you grand views of the golf course and takes you through trees, boulders, bluffs, as you make your way to the Indian Rock House. This natural structure sheltered people as far back as 1000 BC and served as a tribal meeting place. 3. Refreshing Brews, Incredible Views 6 p.m.
After that hike, you’re probably ready for some refreshment! Head straight to the The Little Red Bistro and Bar at Indian Hills. You’ll feast your eyes on gorgeous views of the surrounding woods, and fill your tummy with delicious food. This local favorite is the winner of Trip Advisor’s 2018 Certificate of Excellence. The Little Red Bistro and Bar is THE place where locals hang out at the end of the day, swapping golf and fish stories. Get the scoop straight from those who know and love Fairfield Bay. You may soon make the acquaintance of several new best friends…for you’ll soon find that one of the true hidden gems in this community are the people. After dinner, stroll the grounds nearby, or take in a theater production. But we wouldn’t blame you if you turned in early after your first day at The Bay. Today, experience an Ozark-style outdoor paradise. Good morning! Gorgeous mountain views may tempt you to have a leisurely morning, but this is your day to explore. What are you waiting for? With a big day ahead and plenty of adventure planned for the day, jump up, get out and get going! 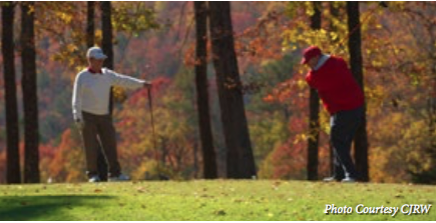 Indian Hills Golf Course offers four sets of tees for players of all abilities to enjoy the natural surroundings, as they make their way around one of the best kept secrets for championship golf in Arkansas. 4. Fore!!! Yup, Grab Those Clubs 9 a.m. If golf is your passion, have we got a green for you! Tee up at the Indian Hills Golf Resort, known by its tree- lined fairways, deep bunkers, small sloped greens, and the Indian Rock Cave located off number nine fairway. The seventeenth hole will thrill you: players must hit across a large ravine to an elevated green that slopes severely from back to front—par three! If you don’t fancy the big links, try our Harris Cup miniature golf course, disc golf or grab a soccer ball (available at the golf shop) and ask about footgolf. There’s a green for everyone. 5. First Class Marina 12 p.m.
Fairfield Bay is a fisherman’s paradise. Rent a boat and explore on your own or hire a local guide — maybe you’ll break a new record! When we say fishing, we mean record breaking fishing! Greers Ferry Lake has some of the nest and most diverse fishing in the region. Striped, hybrid, small mouth, white and black bass, along with crappie, catfish and walleye. 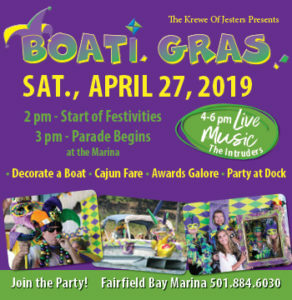 Fairfield Bay has a full service Marina, offering annual and overnight boat slips, boat rentals including pontoons, fishing and ski boats, jet skis, CraigCat, pedal boards and boats, paddle boards and kayaks, as well as snacks and the Belle of the Bay day cruise. 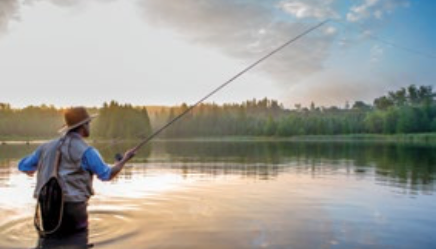 You can fish, cruise, and ski to your heart’s content. If being on the water isn’t your thing, relax on one of our many benches and seating areas to soak in the Ozark scenery. Oh, and be sure to get a souvenir “feeding frenzy” pic. 6. Trail Time 4 p.m. 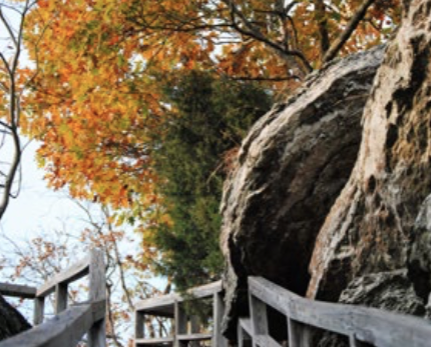 The most memorable way to experience fall in the Ozarks is not in a car. Although the autumn leaves are beautiful for sure, there’s nothing quite like the natural beauty that includes the sounds and smells of nature. Hike the incredible Sugar Loaf Mountain Island trail, one of the nation’s first historic scenic trails. So head out to go hiking or biking. 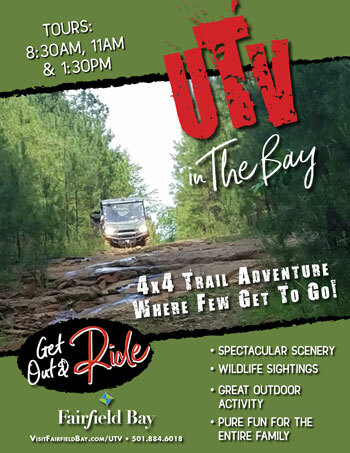 Jump right into exploring one of The Bay’s most popular adventures, The Bay trail system. More than 30 miles of developed trails burst with an abundance of wildlife, plants, natural rock formations and waterfalls. Want more? 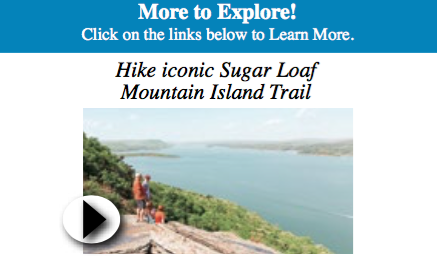 Try Sugar Loaf Mountain Island Trail, one of the nation’s first historic trails. 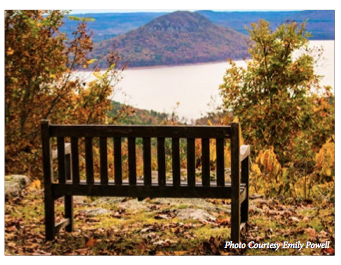 The mile hike up the mountain is completely worth the effort, simply to reach the top and see the panoramic views of Greers Ferry Lake and the Fall’s beauty in all its splendor. Go to the Marina and catch Belle of the Bay, and enjoy a short, scenic cruise to Sugar Loaf Mountain. 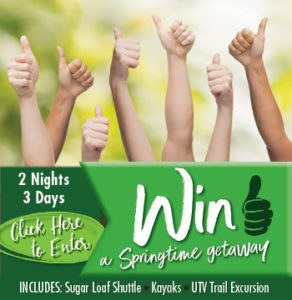 Oh… be sure to post your photos and experiences to Fairfield Bay’s Facebook page. 7. Local Flavors 6 p.m.
Wind down your day with dinner at one of The Bay’s many fantastic restaurants. Enjoy the pizza at Dock of the Bay. If you’re ready to feed your need for Mexican food, El Poblano is for you. Try to save room for dessert. The flan is home made! Not ready to wind down just yet? Fairfield Lanes not only offers great bowling and indoor fun, but has a menu sure to please everyone in the family. Fall is such a beautiful time in Fairfield Bay, you’ll want to squeeze in even more before hitting the road. There’s just enough time — choose a trail you haven’t explored, go o road, or play an early round of golf — all surrounded by stunning Ozark Mountain views. 8. Choices, choices! 9 a.m. 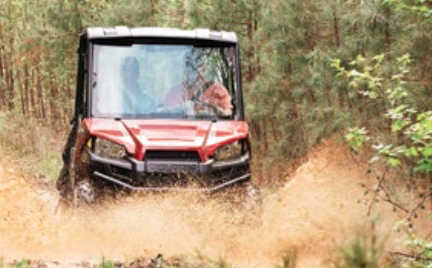 Try a little o road adventure on our ATV/UTV trails wandering through 90 miles of trails. See exciting mountain ridges, gullies, water paths and creek beds. You can bring your own or take a guided tour. We o er tours 7 days a week. Call the golf pro shop to book your tour today, 501-884-6018. Visit our website for more information. Grab an early morning tee time at Mountain Ranch Golf Club, Golf Digest’s #1 resort course in the state and part of Arkansas’ Natural State Golf Trail. This course hosts more than five state golf championships and holds an exciting test for you. The front nine provides a gentle, sloping introduction to the course, while the back nine calls for precision and strategy to navigate a splendid string of holes. 10. Sit and Stay a While 2 p.m. Always feeling like you are home is part of the Fairfield Bay charm. To take a piece of that memory with you, be sure to stop for one last photo at the landmark “Big Blue Chair.” You’ll find it at the entrance, inviting all who enter to sit a spell and stay awhile. Vow to return as soon as possible! Fairfield Bay hosts many festivals throughout the year. 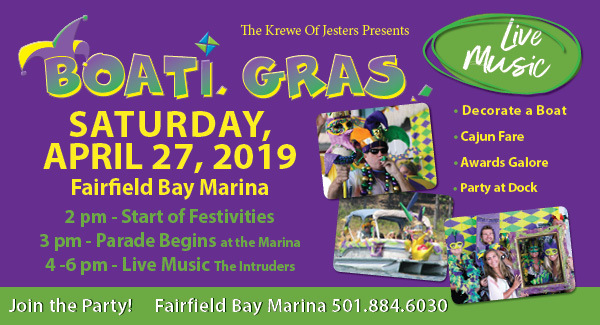 Check our calendar to plan your visit. The Bay is your home base for touring. You’ll have access to some of the best motorcycle roads in the US that traverse mountains and forests, over lakes and rivers, with plenty of hills and curves to make the ride fun and interesting. The Little Red Bistro and Bar– one of Fairfield Bay’s most popular restaurants, located just at the Indian Hills Golf Resort. Try a signature lunch special made with fresh locally grown products, or grab a refreshment from the bar and enjoy the beautiful fall weather on the deck with friends.